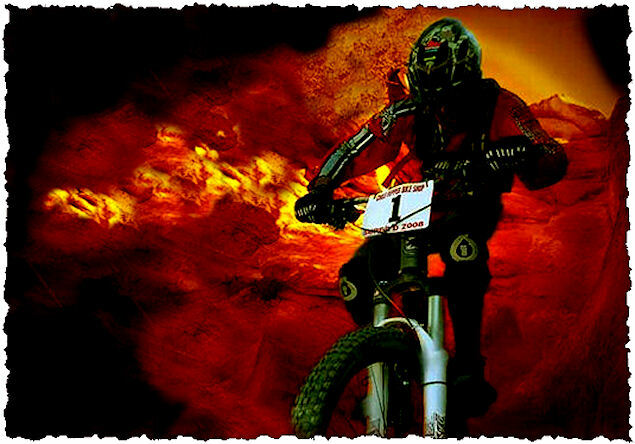 5th Annual Moab Ho-Down Mountain Bike Festival And Moab Mountain Bike Film Fest. The 2010 Moab Ho Down will be a day longer and will feature Moab’s first ever Mountain Bike Film Festival in addition to all of our usual excellent festivities! Chile Pepper Bike Shop is proud to have mountain bike racing at the fall festival known as the Moab Ho-Down Mountain Bike Festival! Down LPS trail (lower porcupine single-track) and the portion of Porcupine Rim Trail that is referred to as the Porcupine climb off of Sand Flats Road. This race is a Super-D time trial and is approximately 5 miles in length. Our permit allows a total of 100 registered men/women sport, expert and open/pro mountain bike riders. This trail and race format IS NOT intended for beginner riders and beginner riders are strongly discouraged from registering. Shuttles will begin taking racers and bikes from the parking area at Porcupine Rim Trailhead on Sand Flats Road to the race start at 12:30pm following the race meeting. point of the race.) The race will start at approximately 1pm. The course starts at the top of the Lazy Man’s put-in of Porcupine Rim Trail located off of Sand Flats Road, approximately 2 miles past the Porcupine Rim Trailhead. The course descends down lazy man’s and makes a hard left turn onto Porcupine Rim Trail and the remainder of the course descends along Porcupine Rim Trail. The course is approximately 2 miles in length. Racers can take practice runs on the course Friday and Saturday prior to race day. Please be aware that this course is on a public trail and will have general riders ascending this portion of the trail both days. It is HIGHLY RECOMMENDED that racers start practice runs after 1pm on Friday and Saturday to avoid the busier morning traffic on the trail. Proper trail etiquette must be observed during practice runs. There will be a race practice shuttle vehicle available at the Porcupine Rim Trailhead on Friday and Saturday afternoon from 1pm to 3pm. Shuttle fee is $10 per day and will be paid directly to the shuttle driver. Racers who are only registered for the DH race will need to be at the parking lot for Porcupine Rim Trail on Sand Flats Road no later than 2:00pm on Sunday, 10/31/10. Racers and their bikes will be loaded in shuttle vehicles and taken to the course start at 2:30pm. Racers will be shuttled in order of class with sport riders racing first (this shuttle is provided as part of your race fee). ONLY racers will be allowed on shuttle vehicles. Spectators can make there way up course from the bottom of Porcupine Rim Trail. The race will start at 3pm. This race is a time trial format and is approximately 2 miles in length. Our permit allows a total of 100 registered men/women sport, expert and open/pro mountain bike riders. Course marshals will be positioned along the trail as well as emergency personnel. One Race Day practice run will be provided for both Super D and DH racers from the Porcupine Rim Trailhead at 11am. Award ceremonies for the Super D and DH race will take place at Chile Pepper Bike Shop immediately following race finish.